2016 has proved to be an exciting year for us at Nobo Jatra with some thrilling highs such as the signing of our Host Country Agreement in August coupled with the fantastic execution of our milestone program launch event in November. 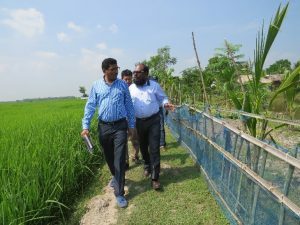 We have had a number of notable visits to our program working areas by valued stakeholders from our nodal Ministry of Disaster Management and Relief as well as representatives from World Vision global and senior management from our national office in Bangladesh. Considerable effort has been expended in building a talented and dynamic team bringing together individuals with a vast wealth of experience to implement our program activities at the national, divisional and Upazila (sub district) level. As part of our goal to improve gender equitable food security and nutrition and our commitment to align with the World Vision Bangladesh pledge to achieve 50/50 gender parity by 2020, we have taken every care to ensure a sound gender balance within our team and I am truly delighted that we have achieved 35% representation of women within our core team till date. It gets better, the ratio of our female frontline extension volunteers stands at 65% for Community Nutrition Facilitators and 54% for Community Wash Facilitators. A tremendous amount of pride comes in leading and being part of a unique, innovative and increasingly gender balanced team such as ours and I have every confidence in each and every member of the fantastic lineup of individuals we have pulled together. Whilst a large part of our energies have been focused on program start up activities, we have also achieved remarkable gains particularly in terms of our cutting edge and real time Management Information System (MIS). Developed in house by our M&E team, the ICT based system is designed to register households and enroll all 856,116 program beneficiaries assigning a unique ID to each individual. Through Nobo Jatra we strive to position ourselves as a thought leader, with a clear intention to move beyond tried and tested models that are not fully appropriate to and do not holistically meet the needs of a large scale program such as ours. 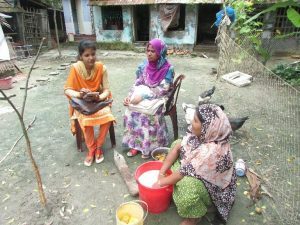 Till December 2016, we have registered 367,173 beneficiaries in total across all four of our working Upazila’s and our front line program staff must be lauded for their incredible dedication and perseverance to achieve this mammoth yet critical task. As we reflect on 2016, partnerships and collaboration with stakeholders underpin all our endeavors. We cannot underestimate the unwavering support from the Ministry of Disaster Management and Relief in helping us achieve milestones such as finalizing the host country agreement, expediting the monetization process, hosting our first program steering committee meeting, visiting our program areas and facilitating our auspicious launch event. 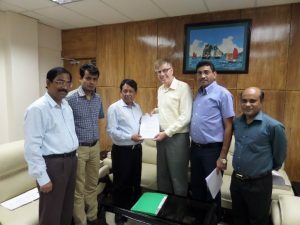 Equally, our colleagues at the USAID Mission in Bangladesh have proved to be a pillar of strength helping us to course correct when we struggle to land on the best way to tackle complex challenges and abetting us to achieve our deliverables. As a shared commitment, our consortium partners World Food Programme and Winrock International have also dedicated major effort to accomplish program activities and targets stipulated for 2016. Equally, the technical guidance from World Vision Bangladesh and our counterparts at the global center cannot be underestimated in any way. Above all, everything we do depends on our existing partnerships and also establishing new pathways to collaboration. I would like to take this opportunity to thank our stakeholders and also start new dialogues going forward to navigate and achieve our Nobo Jatra goal.